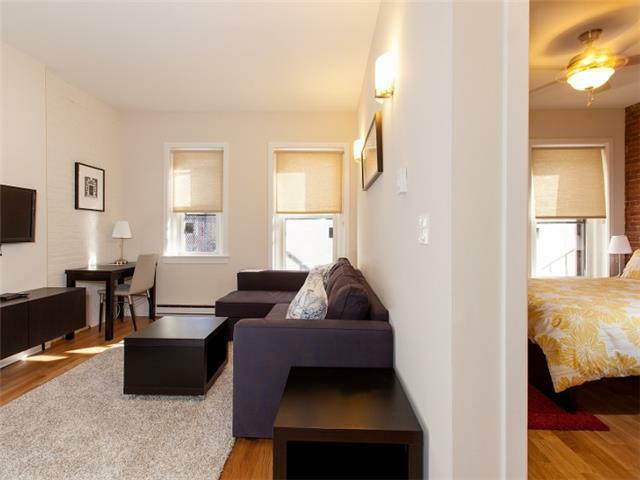 This 3rd floor one bedroom suite features a full sized, open kitchen and living room. 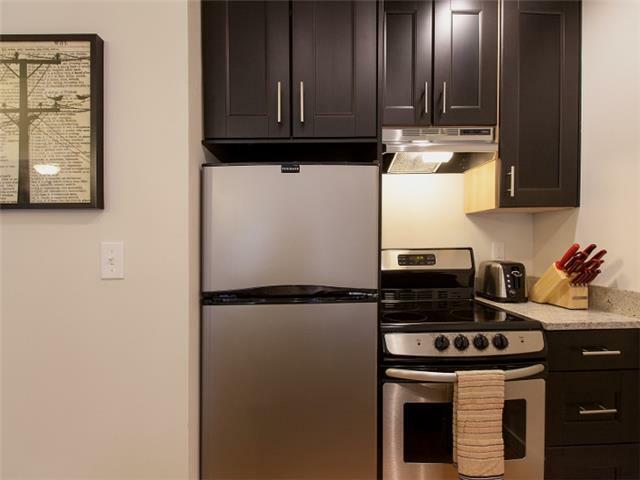 The brand new unit has polished hardwood floors throughout, granite countertops and new stainless steel appliances. The bedroom features a queen mattress set, nightstand, reading lamp and alarm clock. The bathroom has a beautiful tile surround tub and shower combo. The kitchen is fully equipped with pots, pans and cooking utensils, along with oven, range and refrigerator. The breakfast bar seats two, and the desk in the living room has leaves to accommodate two more. The living room has a flat screen TV with local channels, a desk and chair, and the sectional sofa pulls out to a full bed which makes this the perfect unit for two to four people. All units are equipped with wireless internet, irons, ironing boards, hair dryers, coffee makers, toasters, microwaves, linens and towels, as well as a guest book with instructions and recommendations. 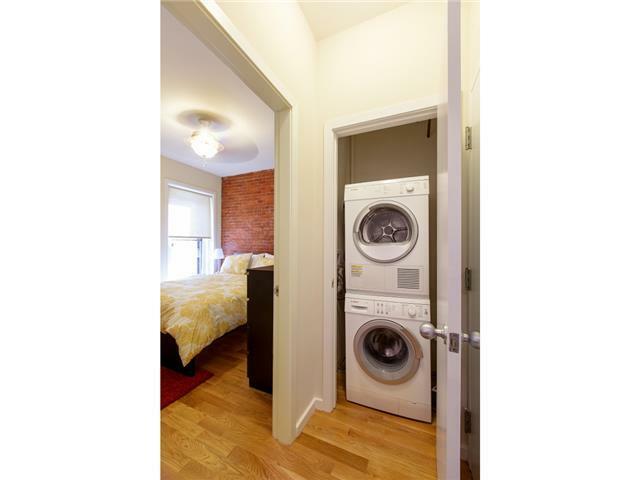 There is also in-unit laundry free for guests use. All building and unit doors are on secure, code-activated locks so coordinating key pick-up and drop-off is not necessary. This unit is accessed using stairs (there is no elevator) and is a 3rd floor walk-up. There is limited parking directly behind the building that may be reserved for additional charge(Click Here to reserve a spot). Parking alternatives are on-street metered spaces or garage parking. 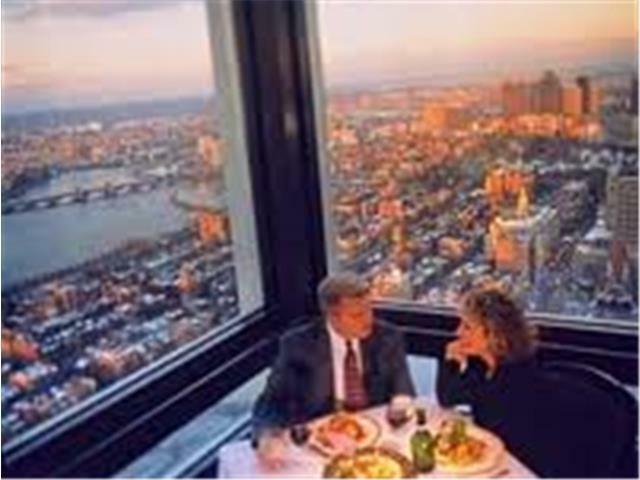 Sonsie Restaurant and Bar	 Restaurant 257 ft.
Top of the Hub	 Restaurant 590 ft. 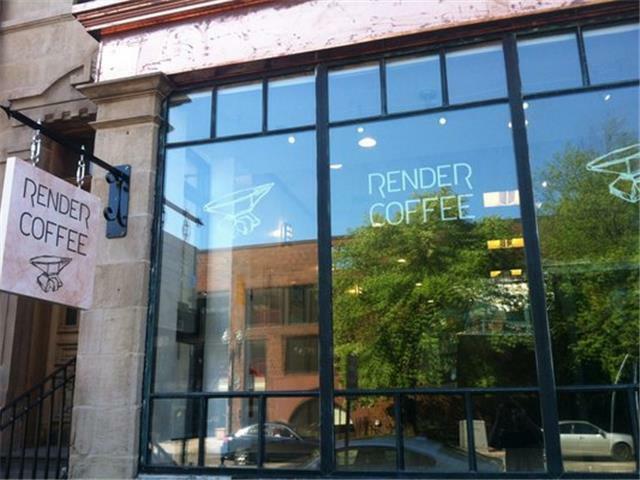 Render Coffee	 Restaurant 2943 ft.
Mistral Bistro	 Restaurant 3234 ft.
Fenway Park	 Sports Center 3386 ft.
MIT	 All Seasons Attraction 3666 ft.
Public Garden	 Summer Attraction 4424 ft. 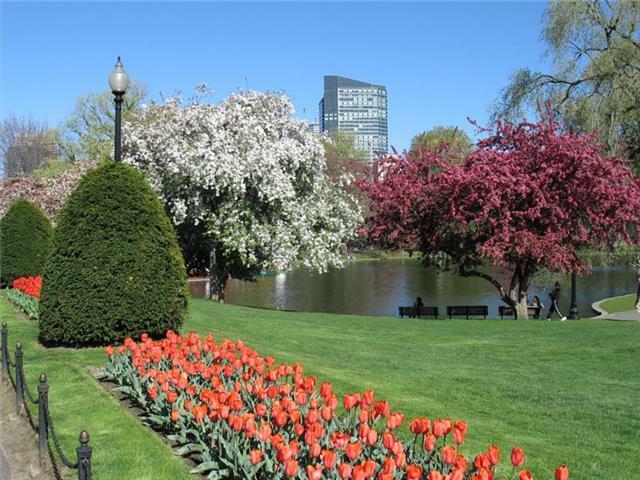 The Boston Common	 Park And Recreation Area 1.09 mi. 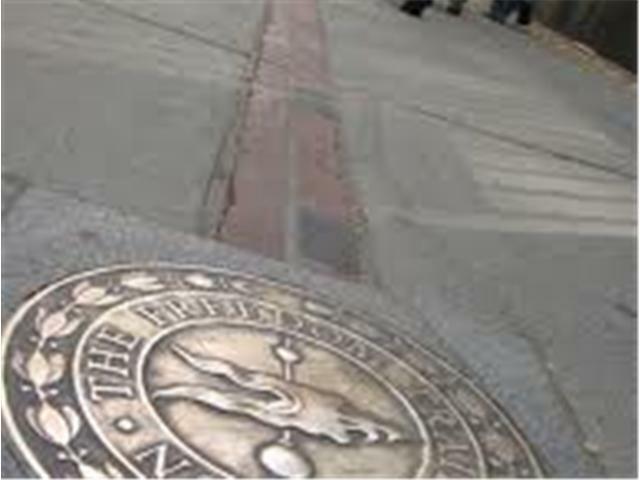 The Freedom Trail	 Outdoor Activities 1.09 mi. 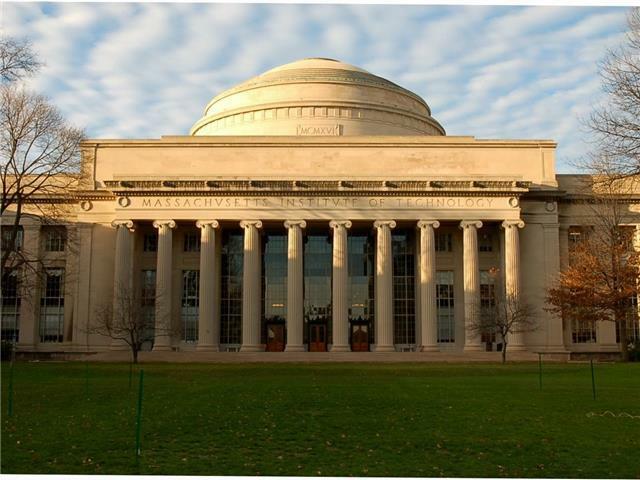 The location is excellent- close to many shops and restaurants and the Hynes Convention Center. The kitchen is well-equipped. The management was responsive to the minor issues we had. That said, there were no toiletries other than soap. This was not mentioned in the description- I would have prepared had I known. The furnishings are IKEA. The rooms face into an alley where trucks come to service the dumpsters at 3 am. We appreciate your stay with us as well as your informative feedback. First, it is to our understanding that many travelers usually bring toiletries with them, but we do apologize for that. Second, the IKEA furniture works in our favor because we change our furniture quite a bit. Additionally, we would not want to have expensive furniture that our guests could possibly damage for any reason. It is more so for our convenience. Lastly, we apologize for the depressing view of a dumpster alley especially because the views of the area have a lot to offer. It is also unfortunate that the trucks serviced at 3am. We hope that was not of absolute disturbance. Again, we are sorry for your inconvenience. We hope that you liked your stay overall and that you choose us the next time. We are glad to hear that your stay was great and that the location was convenient for you. We are sorry about the curry smell and the inconvenience of the stairs. As you know, it is a pretty tight fit to try and install an elevator there. Nonetheless, we hope you choose us the next time around. 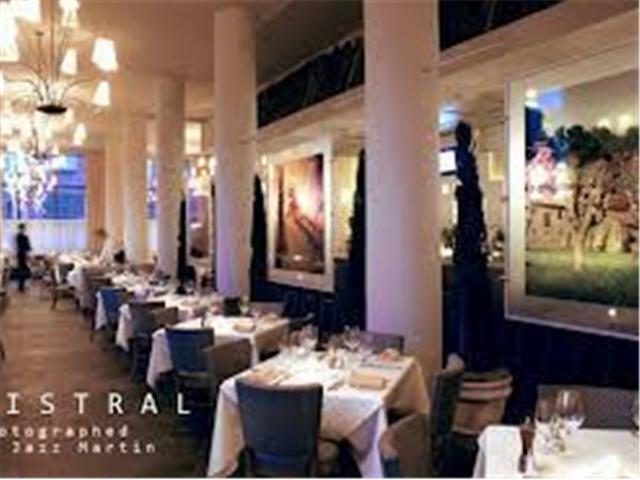 Location is great - on a really trendy street with plenty of shops, restaurants and supermarkets nearby. It's also close to public transport including a shuttle bus to the airport. The unit itself is good. It was very clean when we arrived and although it is not big, our group of 3 thought it was fine for our 2 night stay. The shower is great and the keypad entry is a bonus. The only issue we encountered is that the apartment gets very hot, even though we were there in October. I didn't have an issue with customer service and got prompt responses when I needed to contact them via email. 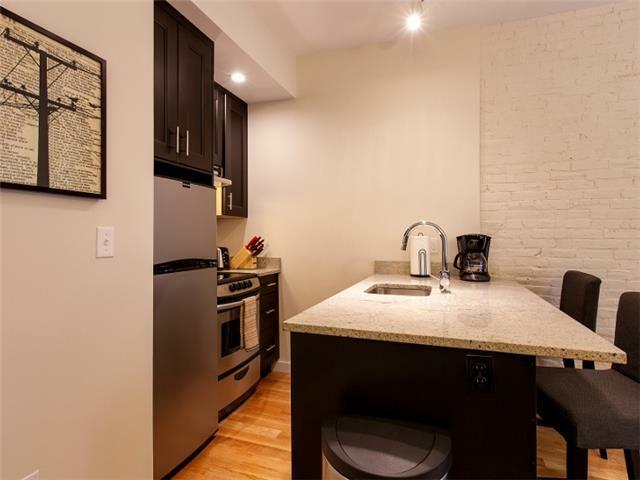 Well-appointed, cozy walk-up apartment in a fabulous location within walking distance of shopping, Boston Common, and Fenway Park. Clean and quiet. The only minor drawback was lack of AC in the bedroom, and the bedroom ceiling fan didn't work. Otherwise, an excellent spot at a reasonable price. I'm so glad to hear you enjoyed your stay, and thank you for the heads up regarding the ceiling fan. Please come back any time! Took the apartment for a convention and it's literally closer than the Sheraton to the Hynes Convention Centre! 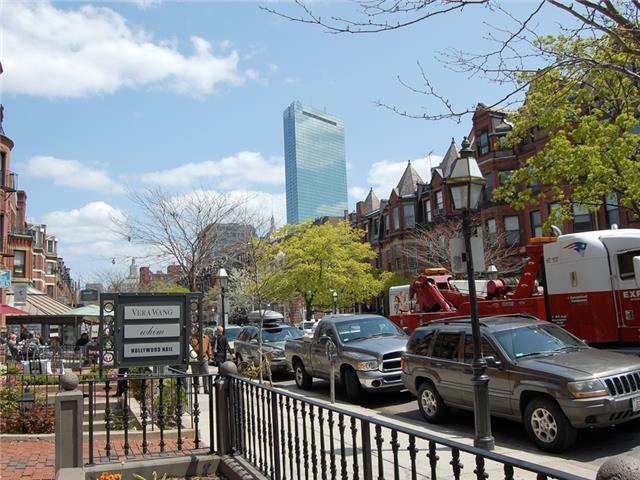 The location is phenomenal - one of the best streets in Boston, one block from the brilliant Deluca's market and a big CVS as well as a small Trader Joe's. Great to have keyless entry via pin pad entry. The apartment is well finished - great kitchen appliances and bathroom nicely fitted, small but everything we needed. Wifi was excellent... BUT The sectional Ikea sofa was so stained it was just a bit nasty and needs immediate replacing... the bed was small but very comfortable (Ikea) but no bedside light as power socket too far from the nightstand... we bought an extension cord from CVS. The overhead bedroom light was blown and not replaced so the table lamp was the only light. Great to have the washer and dryer (Bosch) but handle on washer was missing but replaced during our stay. Window blinds were broken and couldn't be pulled up. Aircon was a small window unit in the main room only and even in October the bedroom was warm but the ceiling fan was good. 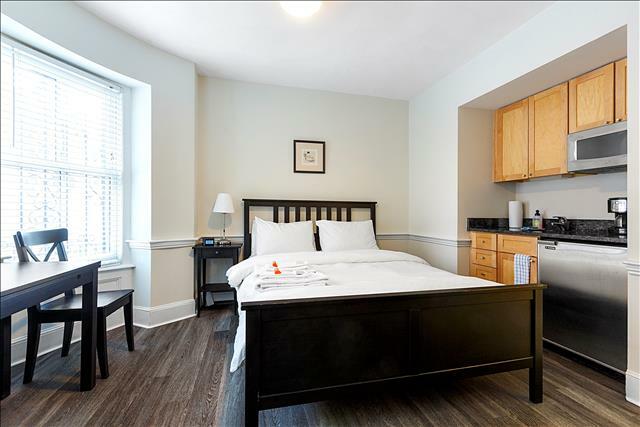 It cost $289 for the weekend nights, which for the location is not too bad, but the attention to detail needs to be addressed at this price point. Thank you for staying with us and for bringing these issues to our attention. 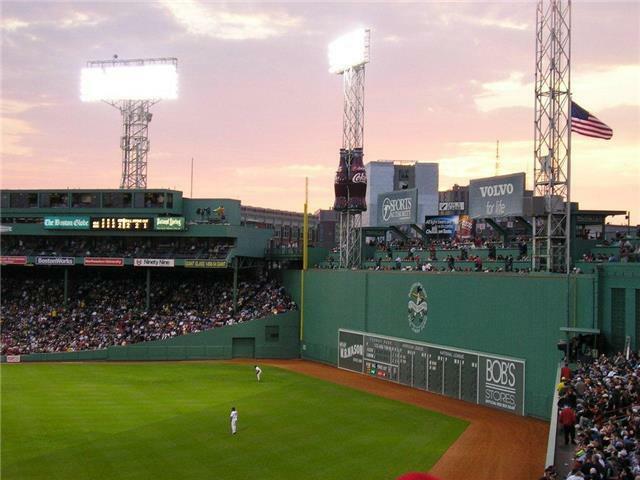 Please let us know any time you may be returning to Boston and we'll be happy to host you! Absolutely the worst customer service I have ever encountered. They do not answer any of the phones they list for assistance and are as unhelpful as can be. I tried to call and finallly emailed about furniture that was coming off the wall. Got an email saying that maintainance had been notified - they never came. I forgot personal keys on the kitchen counter as I left, told them immediately about it, before the cleaners had arrived, and asked that they mail them to me. They never did. The apartment is tiny, it's listed as 45 square meters but can't be more than 30 and cheaply furnished with IKEA furniture. There were towels for 2 guests but we were 4 and had booked it for 4. Found bath towels in a cabinet by the front door and had to make do with that. The walls are very thin and we could listen to converstions in the next apt. and were kept awake by people upstairs as they opened and closed drawers. For this we paid $249 / 220 per night. Definintely NOT worth it. We would, and have, paid for equivalent apartment 80 - 90 in Paris 5th, the Latin Quarter and Berlin Mitte. I give this rental 2 stars instead of 1 because it's location is good and it was clean. I am disappointed to hear about your negative experience at 304 Newbury St. I sincerely apologize for the lack of response from our maintenance team, but it is likely that you may have reached out to us outside of our business hours, which are 9 am to 5 pm Monday - Friday. If this is not the case, please let me know. The apartment itself is a total of 425 square feet. As for your keys, we really do our absolute best to find guests' lost items and return them. I personally looked myself and had our cleaners look multiple times and they were nowhere to be found. Thank you for your understanding. This is a very nice, very clean and very well located apartment. Everything in the apartment was in excellent condition and the renting procedures were easy and smooth. The apartment was spacious & high spec. It had everything you'd need for a stay in the city. The location couldn't have been more perfect, right in the heart of everything. The only down side was that the bedroom itself had no air conditioning. The ceiling fan just circulated hot air & it was very uncomfortable to sleep in the heat. I stayed for 10 days at the end of august with my 2 sons & they had to sleep on the sofa bed in the lounge which did have air-conditioning. I booked the location for my conference at the Hynes Center, but it was unavailable on the last day, so I switched to the Sheraton. The location was really incredible, it was just a few steps to make it back to my room/apartment on a break. 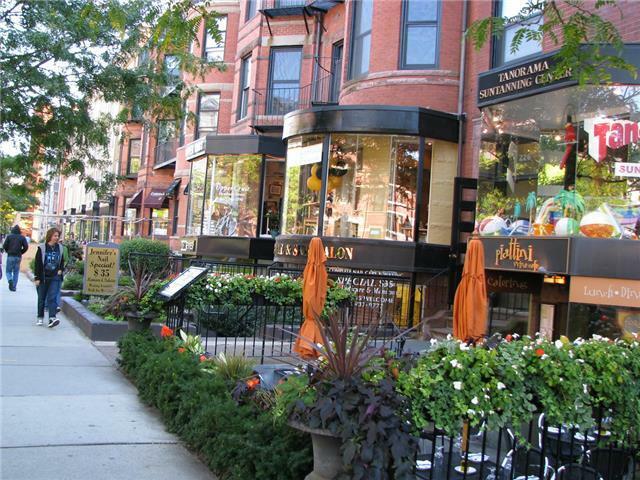 Being on Newbury Street is really nice too, just down the street from Johny Cupcakes, and kewl shops. The floors and ceilings were pretty thin, though. The kitchen was kinda undersupplied, though. 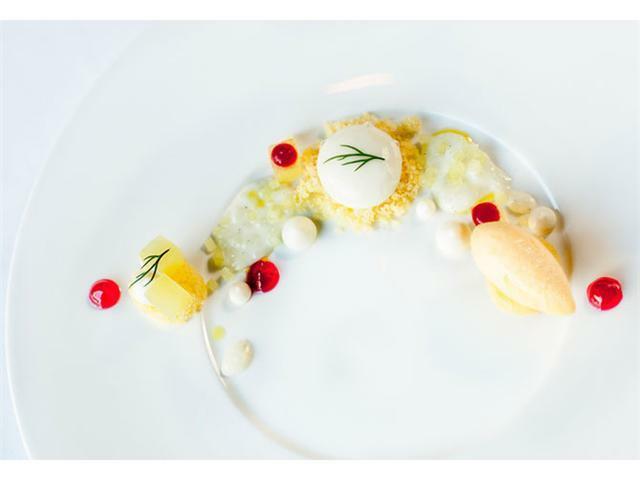 They should include a basic amenity package with salt, sugar, butter, and other condiments. For a three-day stay, it kind of defeats the purpose to save money, if I have to equip the kitchen with the basics. The furniture was mostly awesome, cookware was good, although heavy teflon (stainless steel is healthier). The dishwasher was really loud, and the a/C barely kept the place cool. One would think when a guest is expected, the hosts would turn the a/C (or heat in winter) on to a reasonable level, to greet the guests. But overall, I liked it, night do it again. My Wife and I stayed at Newbury #4 in early June when we visited our Daughter. The apartment is attractive with tall ceilings and complimentary furniture. On the plus side, the central location is excellent for visiting Boston. 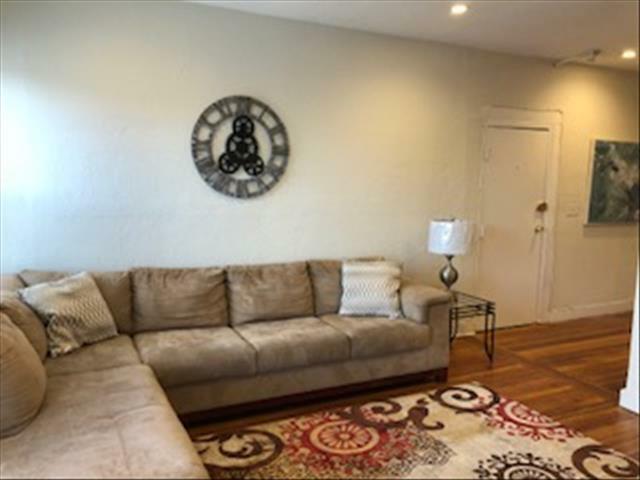 If you love the hustle and bustle of city-life, you will enjoy this apartment. On the minus side, the apartment is hot...under air conditioned. It is also noisy, with a loud garbage truck pick-up next door each morning about 3am. Some furniture, like the end table in the bedroom is poorly positioned (no outlet), and the bedroom ceiling light was out during our stay. We also suffered through power outages 2 of 4 nights we were there--this is no one's fault at Back Bay management. The apartment is as described in the offer. All the equipment is there , great neighbourhood, lot of bars, restaurants and cafes. For the price I highly recommend it. My husband and I enjoyed staying here for a long weekend. Comfortable space for 2 people. 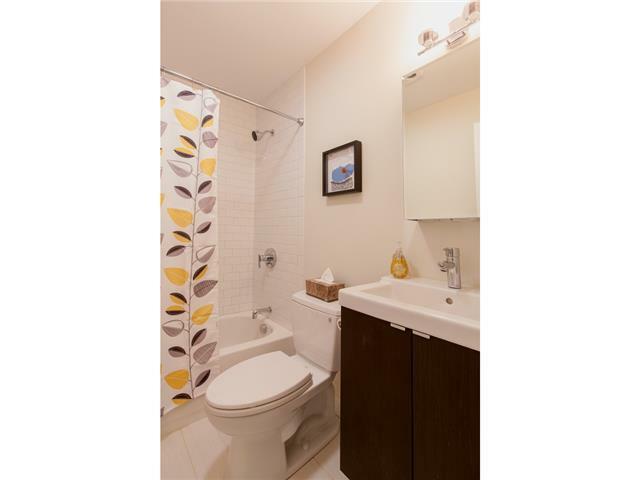 Location is wonderful as you are near transit and within walking distance to shopping, restaurants, and bars. Safe area. Rental agents were easy to work with and answered any questions in a timely manner. An upgrade of linens would make this a 5 star rental. 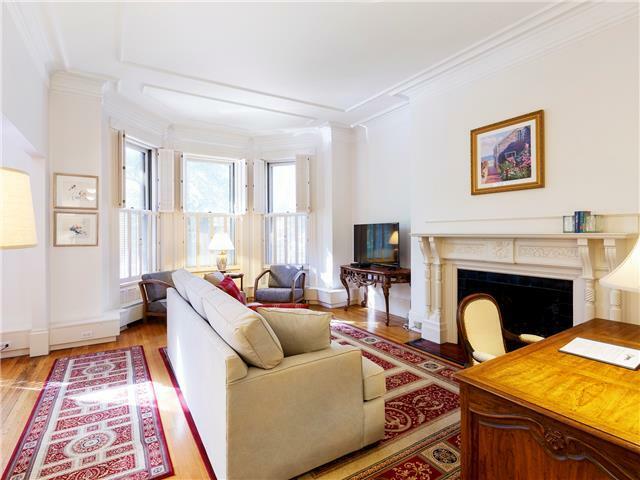 We rented the apartment only shortly before going to Boston and were very pleased with the quality and appointments. 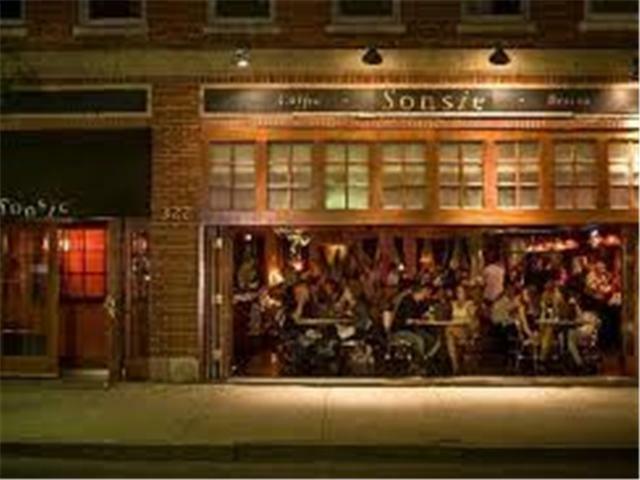 The location is brilliant for Newbury street shopping and eatery's. The communication with Bryan was absolute first rate which we very much appreciated. The apartment was so spacious compared to staying in a hotel room, we would happily stay there again and highly recommend it to anyone. This unit is just as the pictures show. We have a family of 3 and it worked perfect for us. Everything was clean and in working order. 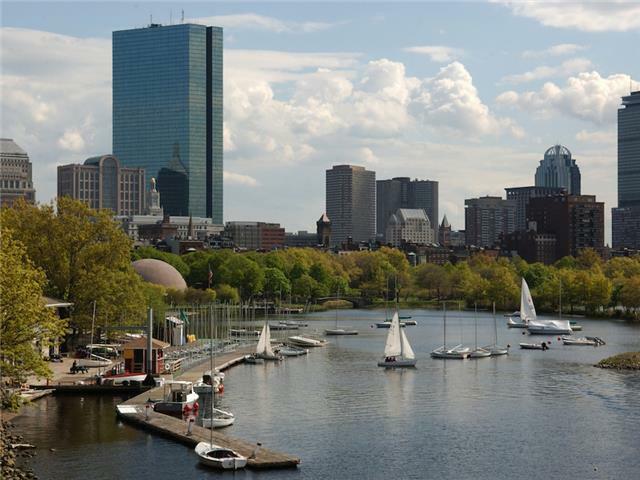 The location in Back Bay is fantastic. 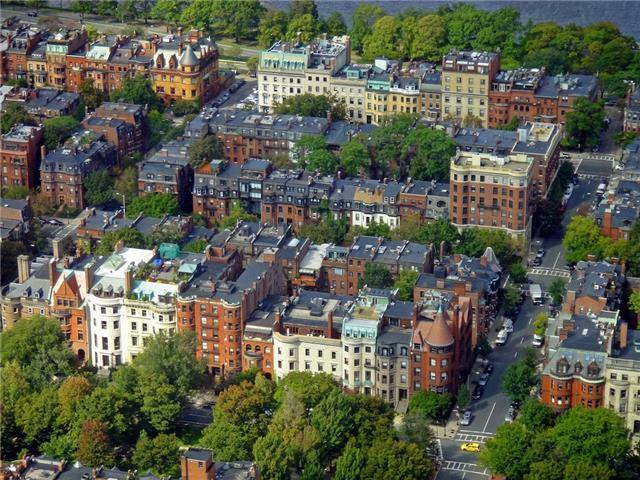 Newbury street is awesome, restaurants, shopping, close to subway. It made our vacation week in Boston all the better. We really enjoyed staying here. Thanks. Things for you to consider as improvements: - supply bath towels for 4 people, we only had towels for 2, my son used the hand towel. - provide more then one kitchen towel, we bought a couple and left them in the unit for next guest. - provide a few baking dishes in the kitchen. - provide dishwasher detergent, we didn't have any, wash by hand. The location was fantastic! The apartment was ok, it was very clean but needed a handyman. The wood floors were scratched from lack of pads on the bars tools, the couch was uncomfortable and the bed pillows were extremely cheap and uncomfortable. The ice tray was broken and leaked water. The toilet in the bathroom was not securely attached to the floor.. A water problem waiting to happen! Also the shower curtain was placed about a foot too high. Overall however, it did the job. I just felt that if the owner paid more attention to detail it would be great. Too small for 4 adults but if you are traveling with small children it would be fine. Thank you for taking the time to review us and provide this feedback. We use this feedback to improve our units. In fact, because you were so quick to report these items, we were able to respond to them and address the maintenance issues immediately. The loft was in pristine condition, all furniture well-cared for, immaculately clean. The accommodations were outstanding with newly remodeled kitchen and full-inclusion of necessary linens and towels. I was impressed by all the attention to detail the owner must put into this space as a rental. 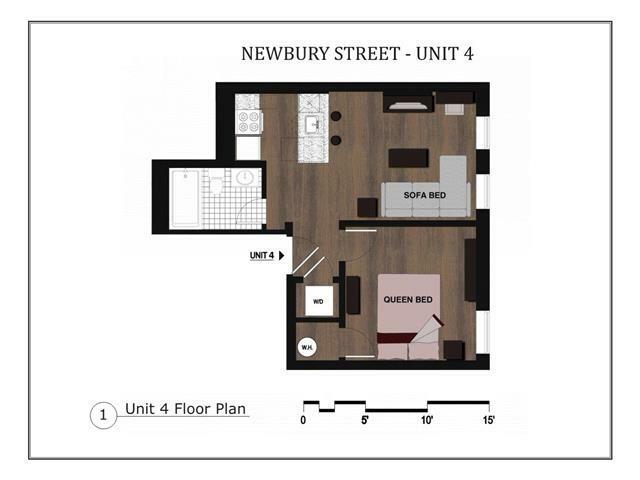 The location of the building is prime, right in the middle of the quaint Newbury bustle. Easy access to the subway system, less than a quarter mile walk. 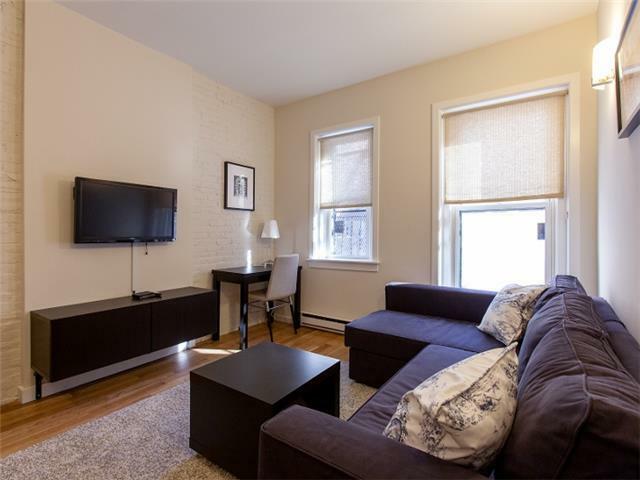 I highly recommend this rental to anybody looking to enjoy Boston and all of the amazing things the city has to offer! We had a great time during our stay in Boston in Newbury #4. 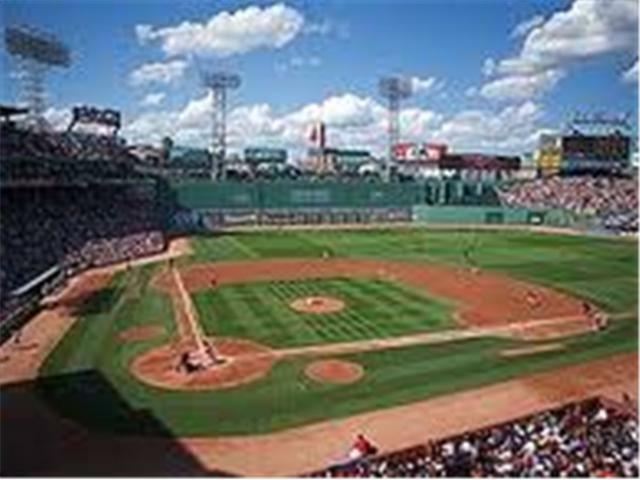 The location is very convenient, a short 1 mile walk to Fenway, and short walk to the start of the Freedom Trail and the Boston Gardens. Cute shops and restaurants along the street and the subway is nearby too. This unit is on the top floor, up 2 narrow flights of stairs so if you have difficulty walking this unit may be hard to manage getting up and down the stairs. Very clean unit that is a little small,I would recommend for couples or family of 4 with children that can sleep on pullout couch together. 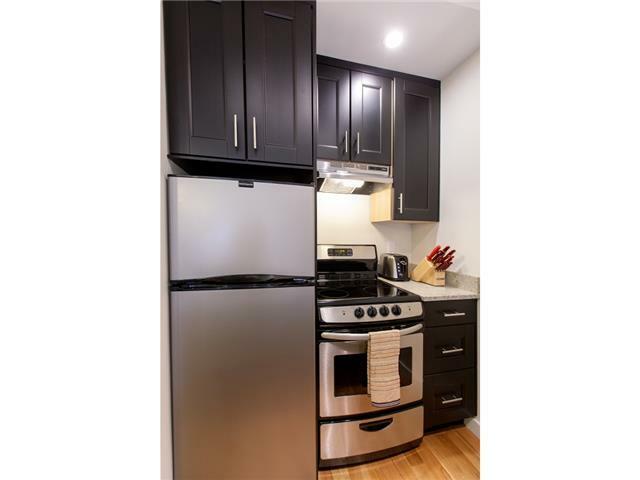 Clean, modern, great appliances, nice fixtures, cotton towels and linens. 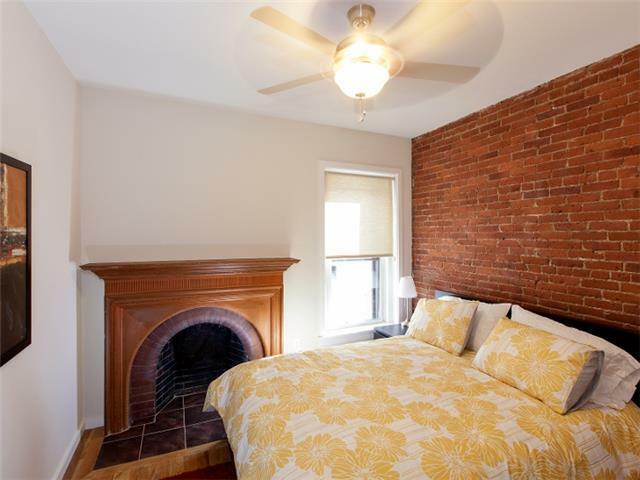 Light, airy, perfect central location steps away from the massport bus to and from logan. To be on Newbury St. was great. The apartment is much smaller than it looks in the photo on the website. The style of the place is dreary; fortunately, we spent most of our time out and about. I am a returning visitor/renter. I have stayed here last april (2013) and again this april (2014). I returned to these units because on my first stay these units were brand new and in the perfect location. I would definitely recommend these units because they are in the absolute most perfect location. Easy to get in and out of. They contain all the basic essentials that one would need. 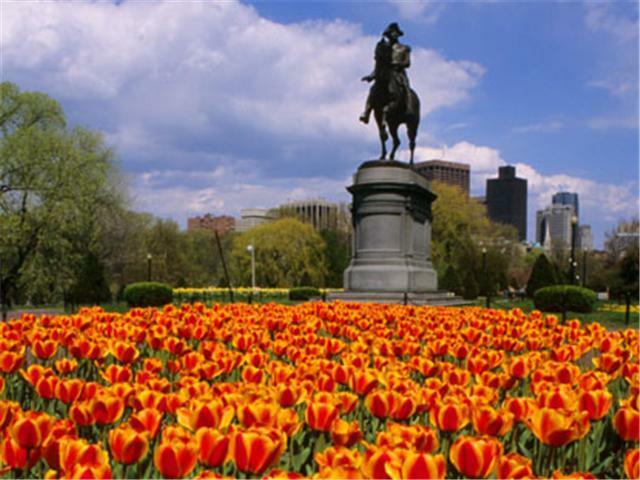 And the people from Short Term Rentals Boston are very easy and pleasant to do business with! My only concern that I had on this last visit, is how poorly the units have been maintained :-( They definitely need to hire some new cleaning people and maybe do a walk-through and look at the over-all upkeep of the units. (floors, ceiling fans, furnature, window coverings, screens etc) This however, is the only negative statement that I can make, because I would come back to these units again and again! !